In case you missed it, or so you don't: a grab-bag of updates, events around Chicago, and Things to Read on the Web. The Paragon Festival is this weekend: 40 Sci-Fi & Fantasy plays in 2 days! Monday 10/3, Fran Wilde & Ada Palmer are talking at Volumes Book Cafe. 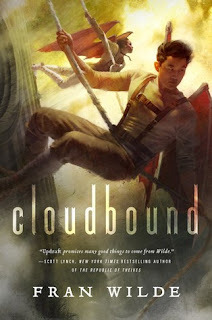 Wilde's "Updraft" won the Andre Norton & Compton awards, and was a Nebula nominee; she'll likely be talking about the newly released sequel, "Cloudbound". I just read & reviewed Palmer's amazing first novel, "Too Like the Lightning", and she's also an intriguing speaker, so I'm looking forward to this. Saturday, 10/8 is Pocket Con, a newly-launched one-day con focused on youth & POC. Cuban SF sensation Yoss will be at City Lit Books on Friday, 10/14. His work has been getting a lot of good buzz. Monday, 10/17, DePaul is hosting an all-day, Mars-centric, "Humanities in Spaaaace!" event, with lectures, performances, and a screening of "The Martian". If you're into author readings, consider checking out Bad Grammar Theater, the Gumbo Fiction Salon, Unreal Open Mic, or newly-launched Strange or Die!, all of which feature speculative fiction of various stripes & spots. Many, many more author talks and events on the events page, and that's not even touching all the non-bookish SF/F/etc. goodness of October: keep your ears open for updates on the CNSC Nerd-O-Ween, maybe check out Dark Chicago for horror film showings & haunted houses, and Mary's Attic is hosting two bonus stagings (yes, stagings) of "Once More With Feeling".